We’d love your help. Let us know what’s wrong with this preview of The Sorcerer of the North by John Flanagan. Time has passed since the apprentice and his master, Will and Halt, led the Araluens to victory against invaders, and Will is now a full-fledged Ranger with his own fief to look after. The fief seems sleepy–boring, even–until the king is poisoned. Joined by his friend Alyss, Will is thr The international bestselling series with over 5 million copies sold in the U.S. alone! Time has passed since the apprentice and his master, Will and Halt, led the Araluens to victory against invaders, and Will is now a full-fledged Ranger with his own fief to look after. The fief seems sleepy–boring, even–until the king is poisoned. Joined by his friend Alyss, Will is thrown headfirst into an extraordinary adventure propelled by fears of sorcery, and must determine who is trustworthy to the king and who is trying to take his throne. Will and Alyss must battle growing hysteria, traitors, and most of all, time. The king is fading, but when Alyss is taken hostage, Will is forced to make a desperate choice between loyalty to his mission and loyalty to his friend. To ask other readers questions about The Sorcerer of the North, please sign up. Ummm... Why is this is book 6 in the series? Is actualy book 5. How old is Will in this book? Elaine Isn't this after his apprenticeship, which would make him 21? 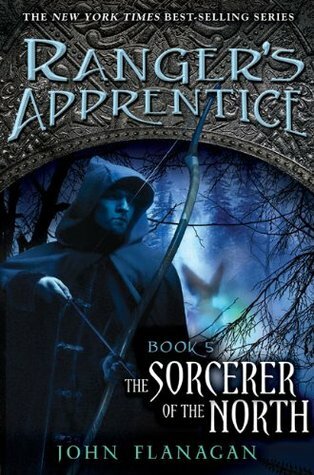 The Sorcerer in the North (The Sorcerer of the North in the US) is the fifth book in the Ranger's Apprentice series by Australian author John Flanagan. It was released in Australia on 4 November 2006 and in the United States on 4 November 2008. Contains mild spoilers for this book and the prequels. The Sorcerer in the North was, unfortunately, my least favourite of the series and probably the weakest sequel too. I was a little irritated by the beginning as it was set an entire five years after the events of The Battle for Skandia. but once I got used to an older will and the surrpisngly obvious lack of both Halt and Horace, it wasn't so bad... until we got pulled away from the new situation - again - and thrust into this new world of cl Contains mild spoilers for this book and the prequels. The Sorcerer in the North was, unfortunately, my least favourite of the series and probably the weakest sequel too. I was a little irritated by the beginning as it was set an entire five years after the events of The Battle for Skandia. but once I got used to an older will and the surrpisngly obvious lack of both Halt and Horace, it wasn't so bad... until we got pulled away from the new situation - again - and thrust into this new world of cloak & dagger (literally) espionage. I'm not saying I didn't enjoy this part - I did - but it was little too rushed. I just wished we had more time to adapt to the new circumstances. Anyway, the first two thirds kept me entertained as usual. I loved seeing this other side to Will, one where he got to be his usual open, friendly self and enjoy himself in public. The last third, however, was what I had a problem with. It was boring. There, I said. I didn't want to have to ever say that with this series but John Flanagan managed to write four solid books so I'll give him that. I found the mysteries' conclusion unsatisfying and even a little anticlimactic. But I did like the fact that there was an escape attempt made that didn't work - it is nice to know that even the best Rangers cannot be perfect every time. I also just missed Halt, Horace, Evanlynn and even Erak. This review has been hidden because it contains spoilers. To view it, click here. I don't know maybe I've outgrown them, but this series doesn't have the same feel it used to. Part of it might be this time there's a more serious tone, and it seems all the trouble Will got into he got into by himself, plus they had to spend time introducing new places and characters. There was almost no Halt and he's my favorite character. There was also no major fight scene as there was in all the other books, it ended in the middle, come on, I'm not afraid of athick book. Don't take me too s I don't know maybe I've outgrown them, but this series doesn't have the same feel it used to. Very good. One of the best in the series. Audio is superbly narrated by William Zappa, but I didn't care for the musical intrusions after each chapter. However, the story is good. Moving at a fast pace, it feels like an adventurous alternative history set in a re-named England (Araluen), in the days of kings, knights, castles, and fiefdoms. No elves. No dragons. Recurring key characters from prior series include Will the ranger and Alyss the courier diplomat (both are now adults, not apprentices Very good. One of the best in the series. Audio is superbly narrated by William Zappa, but I didn't care for the musical intrusions after each chapter. Recurring key characters from prior series include Will the ranger and Alyss the courier diplomat (both are now adults, not apprentices, about 21 years old). We also see the master rangers again, Crawley and Halt. Important new characters include an injured dog, a traveling minstrel dubbed Berigan, Baron Urgal of Seacliff (an island fief), and some Skandians (Vikings) led by Gunda Hardstriker. And let's not forget the nasty John Buttle, and all the frightened — and frightening — inhabitants of Norgate fiefdom, and an ugly fortress on the border of Picta (Scotland). Let's not forget the strange beings in Grimsdal Wood. Be warned — it ends on a cliff. This particular plot is completed in the sequel, The Siege of Macindaw. This series just keeps getting better and better. I was a little nervous when there was a several years jump in-between this book and the last, and there were a few things that were glossed over in this jump (romance) that I wish I had gotten to explore with the characters, but I still enjoyed this book very much. Will is finally a full Ranger, and is out on his own. While most of his growth happened in books 1-4, it is easy to see how much more he has improved in the skip of a few years, and his This series just keeps getting better and better. I was a little nervous when there was a several years jump in-between this book and the last, and there were a few things that were glossed over in this jump (romance) that I wish I had gotten to explore with the characters, but I still enjoyed this book very much. Will is finally a full Ranger, and is out on his own. While most of his growth happened in books 1-4, it is easy to see how much more he has improved in the skip of a few years, and his heightened skills are shown very well through his actions, and he is no longer expecting others such as Halt to come and save him. Will has to solve his own problems, and I really enjoyed seeing how much he had grown up. The humor, as always was great, and I loved that his childhood friend Alyss was finally given a bigger role, and how she was able to grow into more of an actual character, instead of just feeling like stock. I'm a fan of this series, but I felt that Flanagan started doing some great things in this book. It's Will's first adventure alone, and I was happy to see an increased role for Alyss. Flanagan has found a way, in my opinion, to credibly give his female characters important things to do in the context of a medieval world. This book had some themes I think are especially important for adolescents to read--being popular vs. being good, the idea of appearances and making judgments on those appearanc I'm a fan of this series, but I felt that Flanagan started doing some great things in this book. It's Will's first adventure alone, and I was happy to see an increased role for Alyss. Flanagan has found a way, in my opinion, to credibly give his female characters important things to do in the context of a medieval world. This book had some themes I think are especially important for adolescents to read--being popular vs. being good, the idea of appearances and making judgments on those appearances, and the throes and challenges of young love. I like this book, but not as much as some of the others ones. Maybe because Halt isn't in it as much? All he does is bum around with Crowley (as far as the reader can tell). Which probably got terribly annoying to Crowley. But it is neat to see Will learn to do things on his own. Once you're really into this book, you can't stop reading. The only problem was that, for me at least, the first half didn't really grab my interest. It was quite boring, what with all the details and half of the book talking solely about Will's to-be mission. I wanted to get to the mission and once I did, I couldn't put the book down. What I liked most about the novel was the element of mystery. In most of Flanagan's other books, the antagonist and protagonist are both clear as daylight, but in Once you're really into this book, you can't stop reading. The only problem was that, for me at least, the first half didn't really grab my interest. It was quite boring, what with all the details and half of the book talking solely about Will's to-be mission. I wanted to get to the mission and once I did, I couldn't put the book down. What I liked most about the novel was the element of mystery. In most of Flanagan's other books, the antagonist and protagonist are both clear as daylight, but in The Sorcerer of the North, the reader, along with the characters, tries to put the clues together to discover who's who, which was pretty fun. The conclusion to the mystery wasn't unexpected but it was pretty reasonable. "I'm getting Alyss out of your damned castle- if I have to take it apart stone by stone to do it." WHAT? These books have had cliff hangers before, but this is the worst one yet!! I read Erak's Ransom before I read this one, and I'm glad I did. Reading the stories chronologically gives them a better flow. This book was really good, but I liked some of the other stories better. The pacing of this book is on the slow side, and the mystery is not quite as interesting. I missed the supporting characters too. I'm hoping we will see more of them in the next book. One thing I found really unb WHAT? These books have had cliff hangers before, but this is the worst one yet!! Where's the next stink'n book?! *sobs* *wails* HORACE WHERE WERE YOU???! Content ~ A lot of cuss words - just like in every John Flanagan book - and some rather unruly scenes. This book does nothing new but what it does do, it does well. The characters are the best part of the book. The plot can sometimes drag on into another book but it's still a good plot. The last couple of books in this series have been funnier. The settings still though disappoint me as well as the creatures. I was hoping for something new. Instead like the Races and cultures, it's all borrowed from Earth. The Rangers Apprentice series by John Flanagan is truly one of the best series I've read so far in the world of reading. This is one of those books where you are just so compelled to keep on reading. I'm not a huge bookworm most of the time, but these books are incredible! The series takes place in a vast land of kingdoms, battles, and sorcery. Will is centered in Sea Cliff fief temporarily until he is sent to the Northern lands as a jongluer. It is foretold that sorcery is about and a small cast The Rangers Apprentice series by John Flanagan is truly one of the best series I've read so far in the world of reading. This is one of those books where you are just so compelled to keep on reading. I'm not a huge bookworm most of the time, but these books are incredible! This Rangers Apprentice book is incredibly detailed and descriptive, as all the other books are in the series, so much that it makes you feel as if you are right there with them on their adventure. As if it wasn't captivating enough almost every chapter is left with a cliff hanger that forces you to read the next chapter! In the past,I always considered this book to be a bit of a bore; I'm not sure why I ever thought that! The story line is good, and it's exciting to read about Will on his first mission! I love the way he turned out. Well, with Halt as your teacher I suppose it would be near impossible to become anything but one of the best! I really like the character Malcolm, and all the people that live with him in the Healer's Clearing. I especially love the fact that Alyss became involved in the plot, and that In the past,I always considered this book to be a bit of a bore; I'm not sure why I ever thought that! I especially love the fact that Alyss became involved in the plot, and that Horace got sent to help Will; the story is always so much more interesting when those two are on missions together! This has been my favorite book in the series, so far. So, since Horace is now roughly my age I can add him to my fictional boyfriends shelf, Hahah (◍•ᴗ•◍)♡ ✧* !!! Also, so far this cover is my favourite and I absolutely adore this series!!!! One of my reading goals this year was to read some of the series that I have ignored, despite the fact that I was enjoying them. This was one of those series. I read the first four a few years ago and really enjoyed them, then I just didn't pick up the next one. Which isn't really like me. Anyway, this one jumps forward a few years in the story and Will has become a full Ranger. In some ways this was a good jump for me because it was so long since I read the last book. I didn't feel as lost as I One of my reading goals this year was to read some of the series that I have ignored, despite the fact that I was enjoying them. This was one of those series. I read the first four a few years ago and really enjoyed them, then I just didn't pick up the next one. Which isn't really like me. Anyway, this one jumps forward a few years in the story and Will has become a full Ranger. In some ways this was a good jump for me because it was so long since I read the last book. I didn't feel as lost as I might have if it had picked up directly after the previous story. Will was still likable and the story was interesting enough, but I didn't find myself very invested in this one. Maybe it's my current reading mood or the fact that I have been reading a lot more lately, but I found it a little more simple than I would have liked. Oh, wat heb ik GENOTEN van dit deel! De tijdsprong tussen het vorige deel en nu geeft het verhaal een nieuwe impuls. Ook zit het lekker vol met actie en vond ik de humor heerlijk, met regelmaat zat ik met een grijns op mijn gezicht op de fiets (ik luister dit boek op weg van- en naar werk). Not as good as the others. I am very glad I read Erak's Ransom before this one, the time-line order has a much better flow. It is still a good story but there were too many dull parts and a terrible cliff hanger which forces me to read the next one....I might have anyway but I don't like being forced. This takes place several years after the fourth book. Will is a new member f the Ranger’s Corps and has just become one of the fifty full-fledged Rangers of Araluen. Will has just received his first commission and the fief that he will be assigned to—Seacliff. It’s supposed to be really nice, quaint, quiet, nothing to crazy or dangerous. Afterall, he’s now the youngest Ranger in the Corps and this is his first fief. Life at Seacliff is much different from the life that Will Treaty is used to—he This takes place several years after the fourth book. Will is a new member f the Ranger’s Corps and has just become one of the fifty full-fledged Rangers of Araluen. Will has just received his first commission and the fief that he will be assigned to—Seacliff. It’s supposed to be really nice, quaint, quiet, nothing to crazy or dangerous. Afterall, he’s now the youngest Ranger in the Corps and this is his first fief. Life at Seacliff is much different from the life that Will Treaty is used to—he even has a last name from the Treaty that he helped to form between Skandia and Araluen with the new Oberjarl Erak who became a close friend of Will, Evanlyn, Horace, and Halt’s. Together they faced the Temujai army and were able to defeat and stop them from envading Skandia and spreading to Araluen. Thanks to Will and his friends the country has been at peace with Skandia for three years and the raids from the sea wolves have all but ceased. In Will’s life he’s learned that hard work is key and nothing is ever still for long in the life of a Ranger. Within the first month in his fief Will is given a challenge as the first raid from a Skandian crew comes to Seacliff and not only are the people unprepared but totally frightened of the prospect of losing their homesteads. Over the last few years their men have slacked, the people have slacked and they definitely aren’t trained or ready from an assault of any kind. Can Will handle the invading force on his own? Will he be able to spare the people of Seacliff from the raid, even though he’s young and feels virtually inexperienced? Will faces the Skandian crew, in Seacliff, the threat of sorcery, plots, ploys, and disguise as he undertakes the challenges of being a full-fledged Ranger and having to make the calls on his own. This is another great book by John Flanagan about Will’s great adventures. He faces dangers and plots that all but overcome him as he battles to find the truth that seems to be evasive to the most skilled minds. Alyss joins the adventure as both take on a new identity in the hopes of being able to find a way to save their country from certain destruction. Well done and definitely attention-getting. This is a must read of John Flanagan’s and make sure that you have the sixth book close at hand as this one leaves you on a bit of a cliff-hanger! This book is really a great addition to the Ranger's Apprentice series. I am a fan of this series, as it includes a large amount of adventure, wit and great characters. For those who haven't read the series yet, I advise you do. This is the first book in the series where Will is finished his apprenticeship. When Lord Syron of the Norgate Fief in Hibernia is struck by a mysterious illness, Will, Tug, his new dog, and his friend/lover Alyss are called in to figure out what is ailing the Lord of No This book is really a great addition to the Ranger's Apprentice series. This is the first book in the series where Will is finished his apprenticeship. When Lord Syron of the Norgate Fief in Hibernia is struck by a mysterious illness, Will, Tug, his new dog, and his friend/lover Alyss are called in to figure out what is ailing the Lord of Norgate. There are rumors of a dark sorcerer living in the Grimsdell Woods, called Malkallam, who has poisoned Syron. The villagers suspect the Black Art is involved. Will isn't so sure. Suspects are everywhere. Orman, the son of Syron, his cousin Keren the knight, Xander the assistant. Will must add the clues together, and figure out who poisoned Syron... before it's too late. The clock is ticking and Will might find allies in people he least expected. So overall, this book was pretty cool. It didn't have a large amount of action in it, only sporting one or two notable scenes that caused me excitement. I did, however, really like the new Will. He is a fully-fledged ranger now, and is capable of handling himself. He is a lot like Halt in some ways, but uniquely flawed and independent. My only problem with the book was the plot in general. It is basically like a darker-toned Scooby-Doo book. That's not saying I don't like Scooby-Doo. I'm just saying that I don't think he fits into the Rangers Apprentice. Still, John Flanagan entices me with his characters, who are very well built. CHARACTERS: Excellent. 4.6 out of 5.0 (if your thinking, "How do I come up with these figures?" I just make them up. Will finally is set off on his own, but not to fight the straightforward, frontal assault enemies of the past. This time he is up against a legend, an elusive sorcerer rumored to be poisoning the king of a northern fief, a land integral to the protection of the whole kingdom. As with all of the Ranger's Apprentice books, I loved the characters, the battle tactics, the weaving of plot lines, and the setting. Seeing Will strike out on his own was almost poignant, like watching a nephew become an adult. I feel like I know Will, like I am somehow a part of his life, responsible for him or his therapist or something. I also enjoyed the pretext under which Will travels: that of a jongleur, a traveling musician, singing for his supper. This role is so different from Will the Ranger; as a jongleur, he is affable, outgoing, a bit goofy. It's nice to see this side of Will, pushed back because of his secretive, serious duties. I do have one problem with this installment however. The ending. Or rather, the lack thereof. While I appreciate the fact that a series is a continuance of the same story, I like my books to have a relatively full an complete plot. Books, even in a series, which just end with no resolution whatsoever, or in some cases even a climax, drive me bonkers. Everything is up in the air at the end of this one, an unexpected development in this so-far-self-contained series. This unsatisfactory ending is why this installment has received an Accept rating instead of a Borrow. While the story itself is just as entertaining as the rest, that one little travesty (in my opinion) really affected my overall judgment. I realize it's a quite specific pet peeve though, and not everyone feels the same as I do. The Sorcerer in the North is the fifth book in the Ranger’s Apprentice Series by John Flanagan. It starts several years after the last book ended. Will is now a full-fledged Ranger (can I say shame on you for not showing me that happening?) and has his first own fief to look after. But trouble quickly forces him to leave his new home and embark on a secret mission to figure out the truth behind mysterious occurrences in a castle on the northern border of Araluen. This books gives me what I loved a The Sorcerer in the North is the fifth book in the Ranger’s Apprentice Series by John Flanagan. This books gives me what I loved about the first books (badass characters with weaknesses and flaws) and adds a little more. Will gets a doggie!!!! Yes, I’m childish and I want a dog. Sue me. Also, he is finally of an age where romantic plot lines make sense so we can a tiny allusion to a romantic subplot … but it really is very tiny and shouldn’t bother anyone who doesn’t like romance in their books. Also, surprise, surprise, while these books so far were mostly just entertainment, excitement and fun, this one even had some social criticism! My only complaint … it ends on a cliffhanger … again! Seriously, I feel like the author has a thing for having cliffhangers for most of his books. The second ended on a cliffhanger, the third kind of as well and now the fifth! Well, I’ll just have to go and find myself the sixth book now. I'm loving these books... they just get better and better. The characters are growing into wonderful people I truly enjoy reading about. This is the book I'm having to make myself put down to continue on with the "adult" fantasy novel of a gazillion pages. I love that the young adult book with a couple hundred pages and no overabundance of text, is the more immersive and believable of the two. Edit - finished it yesterday over my breakfast. :) They're quick reads & it was easy to guess what w I'm loving these books... they just get better and better. The characters are growing into wonderful people I truly enjoy reading about. This is the book I'm having to make myself put down to continue on with the "adult" fantasy novel of a gazillion pages. I love that the young adult book with a couple hundred pages and no overabundance of text, is the more immersive and believable of the two. Edit - finished it yesterday over my breakfast. :) They're quick reads & it was easy to guess what was going to happen beforehand, but the characters are, again, enjoyable so I didn't mind going along through the life-lesson learning experience with them. This is a really fast read and I enjoyed it, but in comparison to the other books in the series that I've read so far, it wasn't as great in terms of plot and unpredictability. I'm sure the next book will be awesome though. 9/10. I loved this one! Not quite worthy of a 10/10 rating but very close. One of my favourites in the series! For mysteries by this same author, see John A. Flanagan. John Flanagan grew up in Sydney, Australia, hoping to be a writer. It wasn't until he wrote a highly uncomplimentary poem about a senior executive at the agency where he worked, however, that his talent was revealed. It Librarian Note: There is more than one author in the GoodReads database with this name. See this thread for more information. John Flanagan grew up in Sydney, Australia, hoping to be a writer. It wasn't until he wrote a highly uncomplimentary poem about a senior executive at the agency where he worked, however, that his talent was revealed. It turned out one of the company directors agreed with John's assessment of the executive, and happily agreed to train John in copywriting. John began writing Ranger's Apprentice for his son, Michael, ten years ago, and is still hard at work on the series. “You had this young man with you for... what, six years?" Halt shrugged. "Near enough," he replied. "And did you ever understand a word he was saying?" "Not a lot of the time, no," Halt said. Crowley shook his head in wonder. "It's just as well he didn't go into the Diplomatic Service. We'd be at war with half a dozen countries by now if he was on the loose."